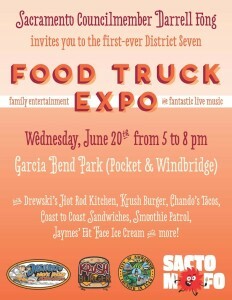 Sacramento Councilmember Darrell Fong hosts his first-ever District Seven Food Truck Expo tonight from 5pm – 8pm at Garcia Bend Park. Along with family entertainment and live music, the event features food trucks such as Drewski’s Hot Rod Kitchen, Krush Burger, Chando’s Tacos, Coast to Coast Sandwiches, Smoothie Patrol, Jaymes’ Fat Face Ice Cream, and more. Call 808-7007 for more information. June 20, 2012 in Chando's Tacos, Event, Fun.